What is classes and how to use it in program? What is function in C#? What is static method or variables? A class in C# is a blueprint or template that is used for declaring an object. However, there is no need to declare an object of the static class. A class consists of member variables, functions, properties etc. A method is a block of code in C# programming. The function makes program modular and easy to understand. 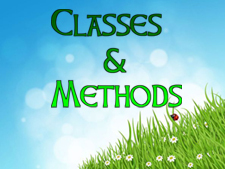 In object oriented programming, classes and methods are the essential thing. It provides reusability of code and makes c# programming more secure. In this session you will learn about classes, methods, static methods and variables, Main method etc. In next chapter you will learn about classes in C#.